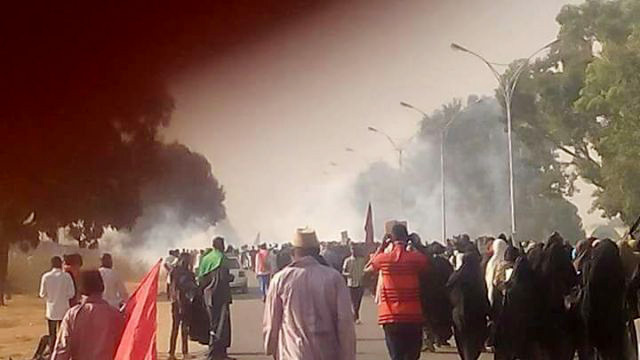 Police in Nigeria have tear-gassed crowds in the capital Abuja to break up a religious procession in the city marking 40 days from the anniversary of the martyrdom of the Prophet Muhammad's grandson Hussain in 680AD, London-based Islamic Human Rights Commission reported on Friday. Videos and photographs from the scene show pandemonium and panic breaking out among the crowd as they try to escape the noxious fumes. One photograph shows a marcher with his shirt drenched in blood from an apparent wound to the face, said an IHRC press release. The annual Arbaeen processions, which are organised by the Islamic Movement of Nigeria, have come under sustained attack in recent years as the state pursues a policy of persecuting and delegitimising the popular movement, said the rights NGO. Nobody has ever been brought to justice for any of the atrocities, read the press release.